Textile Industry will generate 16000 jobs in Uttarakhand. A Textile Park will be establish at Kashipur and Jaspur. 136 acre land has alloted for Textile industry. Company will provide jobs to the unemployed people. Around 16000 jobs will be provided and this will help in district development. SIDCUL, MD Rajesh Kumar said that 83 acre land is alloted at Jaspur and 53 acre land is alloted at Kashipur. This is a good news for both cities and for the living beings. This will increas employment ratio and leads towards development. SIDCUL have decided to establish a textile company at Kashipur and Jaspur. The connectivity of Kashipur and Jaspur will well connect with North India. Every industry will get around 25 acre land for the construction. Company can file application for the industrialisation. Company who will apply first will get it first, allotment will be based on 20% payment in the begining and rest will be paid in installment for 7 years on decided intrest. Property will take back from those company who will not start their industry within 3 years. SIDCUL will provide 100% vat free subsidy to those who will take responsibility to sell and buy the material for 7 years. They will also provide rupee 1 subsidy per unit and make free from unpublished electricity cutoff. 1) 100% stamp duty subsidy on purchase and leas of Land. 2) 100% subsidy on electricity duty for 7 years. 75% subsity on Mandi tax. 3) 100% CST subsidy on selling of prepare material. 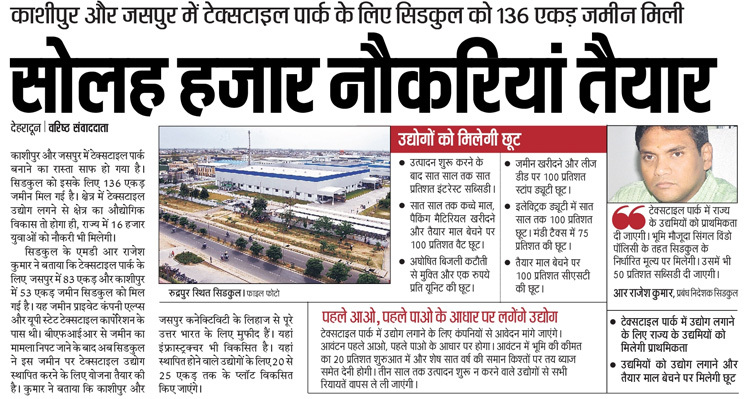 Help us to improve this article/job posting "16000 Jobs in New Textile Park at Kashipur & Jaspur". We would be glad if you can comment below and provide your valuable suggestions and feedback. If this page have any wrong information/list or out of context content, then you can report us as well. Will u update the vacancies are starting in which month. And its govt.based jobs or not. Pls confirm as soon as possible..
Sir,maine sc branch se diploma kiya hai,agr maire qualification se related jobs hai…to plz contact me. Will u update the vacancies are starting in which month. Pls confirm as soon as possible..
Dear Sir Please inform me for this jobs requirement. I have 3 years work experience as a merchandiser in textile industry.If there are any vacancy for me then Pl. confirm. also confirm when will you update vacancies. Hello sir,I have done MSC textiles and clothing now I am fresher and I want to do job if there is any vacancy please inform me.. Thank you. My compete education 3 years diploma in electronics engg. And I have expriance 2 years as a teating engg. I have 23 yrs experience of working in the Textile industry and am presently looking for an opening as a Senior Executive, Processing, Finishing dept. I would appreciate, if you could please notify me for the same. i did Msc. in Textile and Apparel Designing, 2018 Net qualified. notify if there us any job regarding the qualifications.